Software extensions to UCSF chimera for interactive visualization of large molecular assemblies. Goddard TD, Huang CC, Ferrin TE. Structure. 2005 Mar;13(3):473-82. There are several ways to start Multiscale Models, a tool in the Higher-Order Structure category. When a VIPER file is read, Multiscale Models is automatically started and used to construct the virus capsid. Contents are described below in an order reflecting the general work flow. It is first necessary to open a file (PDB or mmCIF) containing either the coordinates for an entire multimeric complex (such as a ribosomal subunit) or the coordinates for a lower-order structure and the matrix information needed to generate a multimer. The types of matrices in a file, if any, can be determined by viewing the file directly in a text editor, or once a PDB file has been opened, using the PDB Headers... button near the bottom of the molecule model attributes panel. See Unit Cell for more about symmetry matrices. Clicking Make models generates a multiscale model for each molecule model with any part selected, or if nothing is selected, every molecule model. Additional copies are shown as surfaces, while the display of the original chains is kept the same. However, the original chains (those with loaded atoms) can be selected and shown in the surface style too. The surfaces of all chains in the multimer are opened as a single model. The set of atomic coordinates first opened remains present, although the atoms may be hidden depending on the display style. Additional copies of the atomic coordinates will be loaded as needed for various display styles. The surface model and all copies of the model comprise the multiscale model. Delete selected models deletes each multiscale model with at least one chain selected, except for the single model that was first opened. The original model may be undisplayed, but it can still be used to remake the multiscale model. Surfaces generated by Multiscale Models are usually low resolution, although higher resolutions can be specified. Low-resolution surfaces are efficient for display because they are graphically simple and require much less memory than the corresponding atomic coordinates. Initial surface colors are assigned automatically, and the surfaces of chains with the same sequence (and all of their symmetry copies) are colored alike. Surface color, resolution and other parameters can be adjusted in the Act on selected chains section. Surface display style, color, and transparency can also be adjusted with the main Chimera Actions menu. The Multiscale Models dialog does not act on standard molecular surfaces, and several Chimera commands that act on molecular surfaces do not affect surfaces from Multiscale Models. Although a surface created by Multiscale Models with resolution set to 0 will have the same geometry as a molecular surface, it is not implemented in the same way. Another way to show a low-resolution surface for atomic coordinates is to calculate a density map from the coordinates with molmap and display an isosurface of that density. By default, the structural hierarchy contains three levels: PDB chain, PDB molecule, and multimer. To define a different set of levels, it is necessary to write a Python script to create the multiscale model instead of using the Make models button. Plans are to develop a user interface for defining the hierarchy. The default levels sometimes correspond poorly to biologically significant levels of structure. For example, the bluetongue virus capsid (2btv, see the figure) is a two-layered structure, with an outer shell made up of trimers in five symmetry classes and an inner shell composed of dimers. 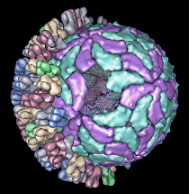 The PDB file contains 17 chains comprising one asymmetric unit of the full virus shell, which is a 60-mer. Levels such as shell, dimer, trimer, and trimer class would be useful in this case. The Python script bluetongue.py loads 2btv and creates the multiscale model with these levels of structure. 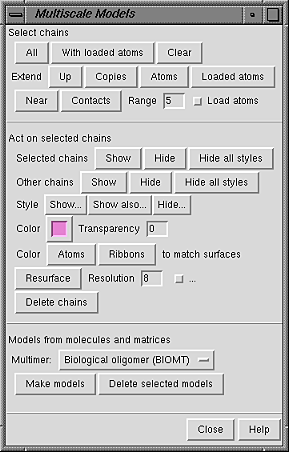 A chain can be selected by picking its surface in the same way that atoms and bonds are picked (by default, with Ctrl-left mouse button click). If the Shift key is held down at the same time, the selection is added to (or subtracted from, if already selected) the previous selection rather than replacing it. Even though a single chain may appear as disjoint segments, the entire chain is selected, as indicated by highlighting of the surface. When a chain has been selected by picking its surface, its constituent atoms and bonds are not selected. However, if the surface or any atoms or bonds within the chain are selected, Multiscale Models considers the chain selected. Even though the chain selection highlighting is only visible on the surface, the chain remains selected when shown in other display styles. The resulting selection also includes all bonds between selected atoms. If the original selection contains multiscale model chain selections without any selection of specific constituent atoms, all of the atoms in the selected chains are considered part of the original selection. The coordinates of all atoms within multiscale model chains are included in the distance calculations, whether loaded or not. If the Load atoms option is on, any virtual (not-yet-loaded) copies with atoms within Range will be loaded and the specific atoms within Range will be selected. Buttons in the Act on selected chains section control how chains are displayed. Display styles, color, and transparency can also be adjusted with the main Chimera Actions menu. Show and Hide display and undisplay surfaces, respectively; Hide all styles undisplays all display styles. This can be done for the Selected chains or for Other chains (the unselected chains within each multiscale model containing at least one selected chain). The rest of the section affects only the selected chains. All styles except Surface require atomic coordinates to be loaded. Show.. displays the chains in the chosen style only. Show also... adds the chosen style to what is already shown, except that a given set of atoms and bonds can only be shown with one representation at a time (wire, stick, ball-and-stick, or sphere). Hide... can be used to undisplay Surface, Ribbon, or Atoms and Bonds. Color and Transparency apply to surfaces only (although there are buttons to color Atoms and Ribbons to match). Clicking the color well allows the color to be adjusted with the Color Editor. Transparency can also be adjusted using the Color Editor (opacity = A = 1 - transparency) or by typing a value in the Transparency field and pressing return (Enter). Transparency can range from 0 to 1; values below or above the range are treated as 0 or 1, respectively. The Resolution (8 by default) controls the level of detail in a surface; a higher number gives a lower resolution. A low-resolution surface is made by counting the atoms in each cell of a three-dimensional grid and then making an isosurface of this occupancy map. The Resolution is the grid spacing in display units (usually Å). The isosurface is smoothed to reduce artifacts associated with using an arbitrarily aligned grid. Setting the Resolution to 0, however, triggers calculation of a solvent-excluded molecular surface instead of an isosurface, based on the current VDW radii and New Surfaces preferences for probe radius, vertex density, and disjoint surfaces. This Multiscale Models molecular surface is not affected by the threshold and smoothing parameters and will not be updated to reflect any subsequent changes in the underlying atoms or their VDW radii. It is necessary to press return (Enter) or click Resurface to recalculate the surface after changes in Resolution or the numerical parameters described below. Smoothing factor (0.3 by default) - how much to smooth the isosurface during each step. In one smoothing step, each surface vertex is moved some fraction of the way toward the average position of the neighboring vertices. This fraction is the Smoothing factor. Delete chains undisplays the selected chains and removes them from the multiscale model. Deleted chains cannot be restored except by remaking the multiscale model. If all of the chains in the multiscale model are deleted, the surface model is closed. Although undisplayed, atomic coordinates for the selected chains are not deleted if part of the original set (the PDB model first opened) or a copy with any chain that has not been deleted. Atomic coordinates are loaded for the PDB model first opened, but additional copies of the coordinates are loaded only as needed, when display styles other than surfaces are shown. When possible, copies are made from the coordinates already in memory rather than by opening the original input file multiple times. If all copies of the atomic coordinates have been deleted, however, Chimera will try to open the original input PDB file again. If the file no longer exists in the same location, an error message will appear. There is currently no way of indicating that the file is available in a different location. Solutions are to restore the file to its former location or, in the context of a saved session, to change the location information within the session file before restarting. Sometimes an excessive amount of coordinate copying is inadvertently set in motion. A dialog enabling the process to be halted will appear after 5 seconds of coordinate copying. Clicking Stop halts copying after the copy in progress is complete.